Scandinavia in the summertime is a MUST. Since the daylight lasts so long, there’s more time to see the amazing sights of Denmark, Sweden and Norway. The best part about Scandinavia is that all the countries and cities are relatively close—which means it’s easy to hop on a quick flight, train or even drive around yourself! So while you’re there, you should definitely indulge in some city-hopping. But where to, and what to do once you’re there? Here’s our roundup of cities and sights that top our list. Copenhagen is filled with amazing food, nightlife and sites to see. It’s a safe and clean city with friendly people. There are endless possibilities of activities to do in the summer such as biking, having a picnic, or riding a hot tub down the canal (yes, you can actually float in a hot tub along the canals and have a drink). If you only have a few days, though, there are a few things you definitely shouldn’t miss. Christiania: Freetown Christiania is an artistic and hipster town that is super fun to explore. There are artisans selling clothes, jewelry, unique street art and performing live music. Pack a lunch and sit along the water for a picnic. Church of Our Savior: Right outside of Christiania is the Church of Our Savior. Want some of the best views of the city? Climb to the top and soak in the views. Tivoli: Tivoli is the second oldest operating amusement park in the world and it’s definitely something you can’t miss. It’s even been said to have inspired Walt Disney! Stroget: If you love shopping, don’t miss Stroget, the longest walking street of shops. Not a big shopper? Head over anyways to watch the changing of the guard or grab a great brunch Café Norden. Nyhaven: You (and your Instagram) can’t leave town without seeing and snapping a few pics of the hallmark picture of Copenhagen. The houses along the canal are vibrant and lined with restaurants with outdoor seating perfect for a summer dinner. You can’t go to Sweden without visiting the capital, Stockholm. It’s filled with history and architecture. Plus, it’s surrounded by water and tiny islands, which makes for some seriously breathtaking landscapes. If that’s not enough to convince you, it’s also home to two UNESCO World Heritage sites in Scandinavia. First and foremost, take public transportation. If you’re from the US, it might sound crazy, but the subway stations in Stockholm are actually a place to visit in themselves. The stations are almost all covered in artistic works from over 150 different artists, including mosaics, paintings, sculptures and more. Gamla Stan: “Old Town” Stockholm is one of the most well preserved medieval city centers in Europe. It’s not hard to get lost in the cobblestone streets admiring the different colors of the buildings. Djurgarden: Even if you’re one of the few people in this world that doesn’t like to jam out to ABBA, its still worth visiting the cool interactive museum. Bring your student ID and get a discount! The Royal Palace. Pretend to be royal for a day? Don’t mind if we do. The Royal Palace is the official residence of the Swedish monarch. Several areas of it, as well as a museum and a church, are open to visitors year-round. If you get a chance to visit during the holiday Midsummer, people will be celebrating with a smorgasbord of food (aka tons.of.food). You’ll find a lot of traditional Swedish and Scandinavian dishes like pickled herring or boiled potatoes and dill. If that’s not your style, you can find TONS of options at Östermalms Saluhall. It’s been Stockholm’s main food hall since 1888. The original food hall is being renovated right now, but you’ll still find the whole market open in an alternate location (you can find details about the current hours and location on their website). Typically, when you think of Norway, you think of the cold, snowy Arctic north. However, Norwegians really know how to make the most of their summers! 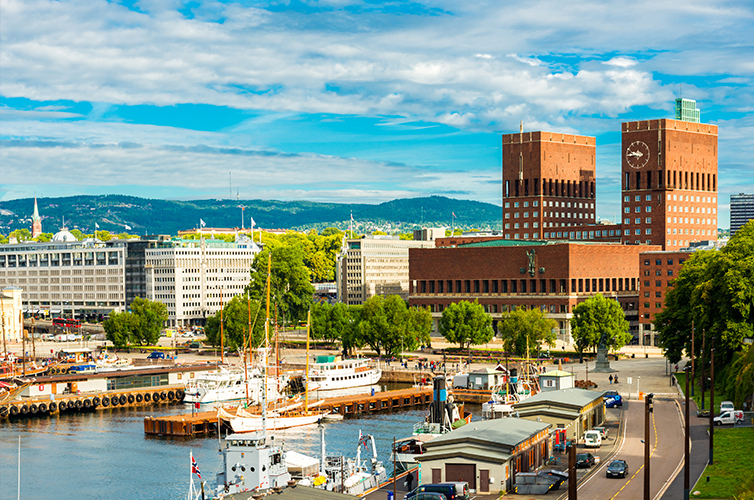 Plus, Oslo is only a one-hour flight from Copenhagen and Stockholm, so if you are in Scandinavia, it’s a can’t-miss city. Fjords: Norway is known for its fjords, but you won’t have to go far from the city to experience them. You can go swimming in a fjord (yeah, you read that right) right in Oslo at the Sorenga pool. It’s open year-round (but we hear it’s best in the summer). Vigeland Park: Want to see some amazing art for free? Just take a walk around the Vigeland park and enjoy the dozens of sculptures installed around the park grounds. It’s the largest sculpture park that’s made by a single artist! Oslo Opera House: Aside from being shaped like a giant glacier, the Oslo Opera House is a super cool place to hang out for the afternoon. It’s a good spot for a picnic and you can even walk up onto the roof to enjoy views of the surrounding city and nature. Want to enjoy a show? You can get tickets to theater performances, operas and ballets. Take a scenic ferry: During the summer months, you can take a ferry from City Hall to Bygdoy, which is home to several museums worth visiting. Whether you want to visit the Royal Manor or the Viking Ship Museum, there’s something for everyone. Holmenkolen: Whether you want to practice your skiing while you’re in Scandinavia, soak in some incredible views, or just snap some scenic pics overlooking the city, the Holmenkollen area has you covered. You can also see the enormous Holmenkollen ski jump! In a word, brunch. While you’re here, you definitely need to indulge in a Scandinavian brunch once or twice… or, okay, maybe every day. Miss Sophie’s and Brasserie Paleo are two amazing places to start. Food with a (fjord) view. Brasserie Posten in Geiranger has an incredible menu for lunch and dinner. But, even better than their menu is their spectacular views of the surrounding fjords. There’s indoor and outdoor seating, too, so you’re good to go in any season. Geiranger Sjokolade. More food, more views. This fancy chocolate shop is also (conveniently) nestled right in the mountains and fjords, so you can enjoy your chocolate with some views. Enjoy special flavors like apricot, chili and whisky chocolates! Rooftop bars. On a nice day, there’s nothing better than enjoying a rooftop bar with views of the city. Stratos, Eight Rooftop Bar and Summit Bar are some of the most popular. What are you waiting for? 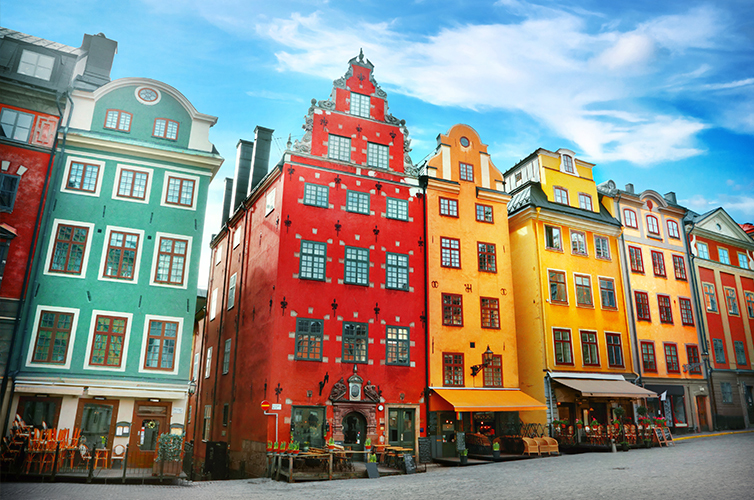 Grab a cheap ticket to Scandinavia with SAS and start planning your city-hopping tour.